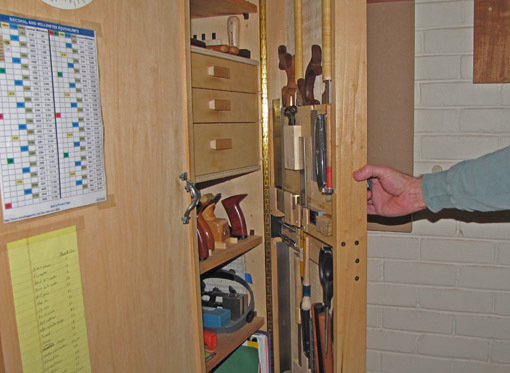 Heartwood » Blog Archive » Good days and bad days in the shop – why? Good days and bad days in the shop – why? Well, a bad day in the shop sure beats a good day doing a lot of other things! Seriously though, I want to explore the unnerving phenomenon of why sometimes working wood I feel like I can do no wrong, everything just flows, and yet at other times I feel like a neophyte who needs all the good luck in the world for things to go right. Can you relate to this? I am not referring to obvious interference from things such as fatigue, worries, tool failure, wood disappointments, struggles with a new technique, and so forth. Rather, the mystery is why, absent apparent hindrances, some woodworking sessions are strained, poorly productive, lacking in confidence, or simply a struggle without ease. Here is the best I’ve been able to discern. At least, I’m convinced that what follows is the key for me. I believe that to be simultaneously effective and at ease in woodworking requires heightened awareness of how the process at hand, each moment of it, fits into the larger picture of the piece being made. In other words, one does not just execute isolated procedures, such as sawing to a line, but maintains a background cognizance of the larger role of the task at hand in what is being created. Working with this sense of direction produces focus and concentration. It also extends beyond the piece in process to a larger commitment of purpose about one’s woodworking in general. Everyone has his own view in this regard, of course, but it should be carried into the shop and kept alive in the background. Work flow in my shop deteriorates and mistakes creep in when tasks are abstracted from their larger purpose. The right approach is, for example, to plane a board flat, not as an isolated goal, but to work it flat enough, appropriately nuanced, so the board will fulfill its role in the piece. Yes, this is a simple notion, but it is easy to get carried astray in the course of all the steps in building a piece. I find that a quick mental warmup to attend to these matters greatly helps my focus when starting work in the shop. In short, a clear sense of purpose, at all levels, is the key to a good day in the shop! Does working wood thus imitate life in general? Yes, that’s the other side of the coin, as there always is. Still, I think that sense of purpose does fill the background as one focuses on the present. It references the present task – creates a place for it – allows one to focus. Like sports teams going into a game. Life, woodworking, and puzzle making putting together are all the same. You have to follow certain rules and only fit pieces into each that will actually fit. There is a natural progression to follow. I certainly think that each individual will find his own path out of the forest given a compass and a map. The same applies to woodworking in that you can obsess about it down to minutia and still lose the el grande mosiac. For me I have found that if I don’t pay attention to what I am doing at that specific moment and I am looking at the end result, I lose because I will inevitably forget to do something. So I think you have to keep and balance what you doing now to what you eventually expect that result will bring. I have found that if I do not keep the end goal in mind while focusing on the task at hand I tend to wander mentally and make those stupid mistakes. I have learned that if my mind starts wandering or I seem to be making that kind of mistake I need to walk away for a bit, refocus and then get back to the project. The old thing about balancing yourself and staying in the moment with your work really helps. Good post Rob! For me, I find I make mistakes or have bad days more with things I’m comfortable with rather than things I’m not so sure of. I don’t know how many dovetails I’ve cut, but my most recent set didn’t come out so great I think because I let my mind wander while working. I was talking to my kids and my wife while sawing and chopping, thinking about other things and just not giving the dovetails 100% of my attention. I often have to remind myself to focus on the task at hand when working on tasks I’ve done so many times that I feel like I should be able to do them in my sleep. The reality is, without complete focus on what I’m doing, I don’t do it so well no matter how many times I’ve done it before. I find the opposite to be true with things I haven’t done before or don’t do very often. I tend to really get into the process and focus on my work, and things usually turn out better than I expected. Yea, Bob, me too, exactly! By the way, here’s another way to think of having a “background cognizance” of your sense of directon and purpose. When you enter the shop, you switch on the light. The light always fills the shop, silently in the background. Yet it allows you to direct yourself to and focus on the task at hand.